Item # 296318 Stash Points: 3,999 (?) This is the number of points you get in The Zumiez Stash for purchasing this item. Stash points are redeemable for exclusive rewards only available to Zumiez Stash members. To redeem your points check out the rewards catalog on thestash.zumiez.com. 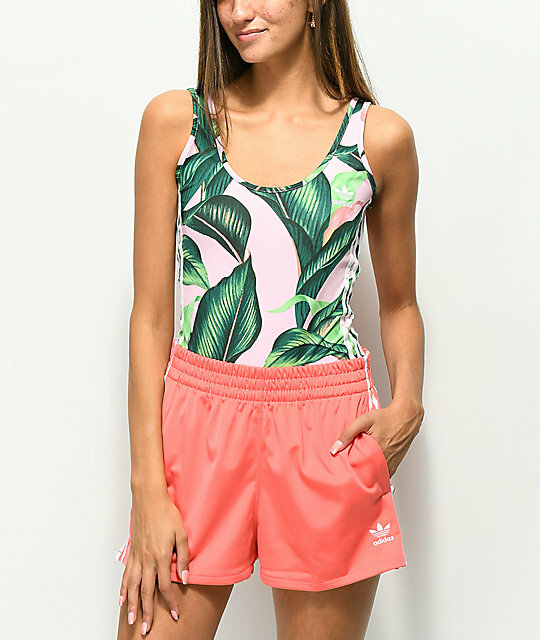 Take your athiesure inspired outfits to the next level with the Pink Palm Bodysuit from adidas x Farm. Coming in a pink and green colorway, this bodysuit features a palm print at the front while the back displays a gridlock pattern for a fun look. Complete with adidas 3 stripe logo apliques along the side seams, this one piece body suit is sure to provide a unique look! 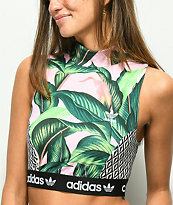 Pink Palm Bodysuit from adidas x Farm. adidas and FARM Company Rio de Janeiro-Inspired Collaboration. Pink & green colorway with palm and gridlock patterns. adidas Trefoil embroidered on the left chest. Signature adidas 3 stripe logo apliques at the side seams. Length: 27.5" from top shoulder seam to crotch hem (64cm).